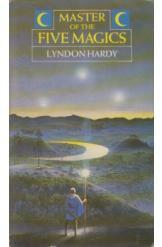 Master of the Five Magics by Lyndon Hardy, Sci Fi. Book is in good condition, all pages intact. As a mere apprentice sorcerer, Alodar is unworthy of the hand of Queen Vendora, even after saving her from a demon-inspired coup attempt. Alodar must master all five branches of magic if he ever hopes to woo her, but he discovers that behind his rise to power is a demonic plot that will put the entire world at stake.